The baddest BIG and SMALL TIRE no prep action you'll find is at the Dirty South NO PREP season FINALS! 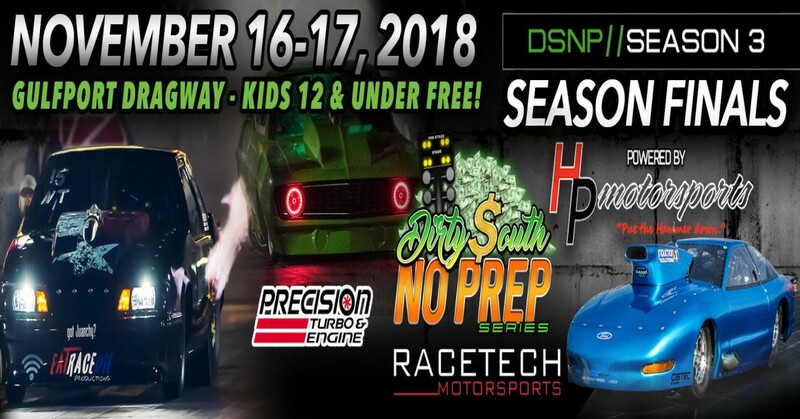 DSNP is wrapping up our 3rd season and we are going out with a BANG in beautiful Gulfport, MS, November 16-17, 2018 @ Gulfport Dragway! ALL of the baddest no prep names you will be on the property and NOTHING WILL BE HELD BACK! THIS WILL BE THE RACE YOU DO NOT WANT TO MISS! >> Racers, FREE racer class entry on Saturday. Multiple class entry is permitted! >>Spectators, $20 for Friday admission, $25 for Saturday, or $40 for the weekend! Kids 12 and under get in FREE all weekend! >>STAY AFTER THE EVENT SATURDAY NIGHT FOR A SPECIAL, LIMITED SEATING, VIP PARTY WITH THE RACERS INCLUDING FOOD AND A VIP WEEKEND PASS FOR $75 IN ADDITION TO GENERAL ADMISSION! ONLY 100 SPOTS AVAILABLE!